To enable students to develop confidence and enthusiasm about communicating effectively through written and verbal responses. To develop close-reading skills, with a focus on extracting key information. Adventures in English; What the Dickens! (An introduction to Victorian Literature); The English Language over Time; Shakespeare’s Much Ado About Nothing; Poems from Other Cultures; The Brothers Grimm – The Power of Fairytales. Homework tasks include: weekly spelling and vocabulary tasks; extended writing; research tasks; revising and improving work in response to feedback; wider reading. To develop formal, analytical writing skills. To explore texts in depth, examining the writer’s craft and applying techniques in our own writing for a range of different audiences and purposes. Education in Literature; An Introduction to Dickens’s A Christmas Carol; An Arctic Project; Shakespeare’s Romeo and Juliet; War Poetry; Willy Russell’s Our Day Out. To prepare students for the GCSE course and give them the opportunity to practise the skills they will need in Years 10 and 11. 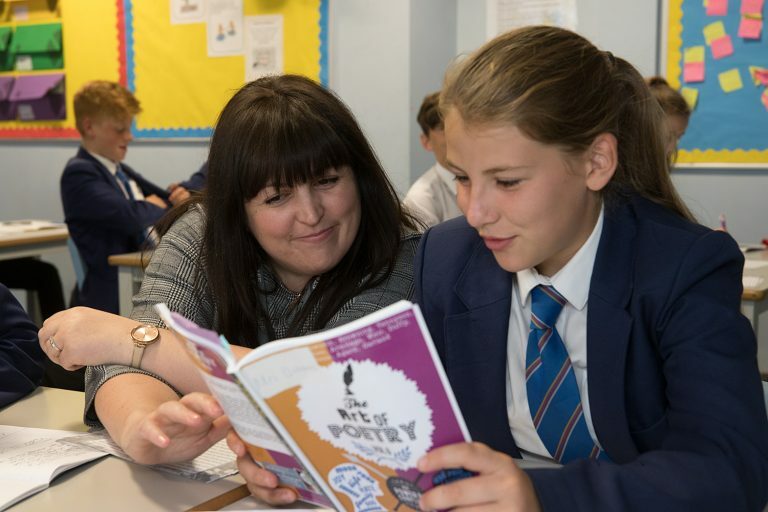 There is a focus on increasing independence, building on learning from Years 7 and 8 whilst broadening students’ knowledge of a range of genres, subject terminology and critical viewpoints. Gothic Writing; John Steinbeck’s Of Mice and Men; Social Revolution; Willy Russell’s Blood Brothers; GCSE Anthology Poetry; J.B. Priestley’s An Inspector Calls. Homework tasks include: extended writing; research tasks; revising and improving work in response to feedback; wider reading. To develop analytical reading and academic writing skills through the study of key GCSE Literature texts. To practise crafting written texts, both fiction and non-fiction, for different purposes and audiences. Short stories and narrative writing; Dickens’ A Christmas Carol; Non-fiction Reading and Writing: Survival/Travel; GCSE Literature Anthology Poetry; Thematic Unit: War. Homework will focus on: independently practising skills taught in lesson; wider reading; research tasks linked to the context of texts studied; revising and improving work in response to feedback; completing exam-style responses. BBC GCSE Bitesize and CGP study guides are recommended for the various topics covered over the year. To encourage students to read a range of fiction and non-fiction texts and to prepare students for writing accurately in a range of styles. To revise the GCSE Literature texts studied and develop exam skills. Frequent mock exams will be undertaken to ensure students are well prepared for the four exams they will sit at the end of the year. Shakespeare’s Macbeth; Revising An Inspector Calls and A Christmas Carol; Preparing for Language Paper 2: Non-fiction Reading and Writing; Preparing for the Poetry Exam; Preparing for Language Paper 1: Fiction Reading and Writing. The focus is on independently practising skills that have been taught in the lesson, revising and developing exam technique by improving marked responses. Students will also be required to learn a significant bank of terminology to strengthen their analysis of literary texts. BBC GCSE Bitesize for revision and CGP study guides are recommended for students to work at home. For more information about English curriculum please contact Mrs Dobbins.